In BIG B's fabrication and welding department we have the capability to manufacture both small and large parts with the use of our Prima Platino 4000 and 5000 watt three axis high speed lasers. These lasers have the capability to cut up to ¾" mild steel, ½" stainless steel and 3/8" aluminum. Our oxy/fuel/plasma table with a 8' x 20' bed that can cut up to 12" thick material. 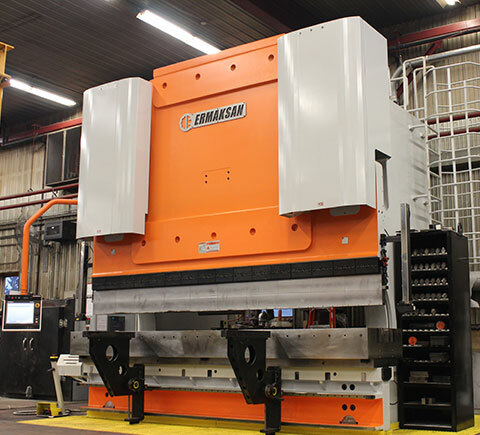 Once the parts are cut we can form them on one of our 2 Gasparini 8 axis press brakes or our Ermak CNC 4-Axis 1100 Ton Press Brake with a 13.5’ bed length. If welding is what your part needs we would have one of our AWS or ASME certified welders work on the part and our certified weld inspector inspect the part. We also have the welding capability to do various die repairs.